Two times a year I get to throw birthday parties for my fabulous kids. I don’t feel like I have to do elaborate Pinterest parties, or do Pinterest parties justice. What I like to do is celebrate my kids, make it memorable, and add details I think are fun. 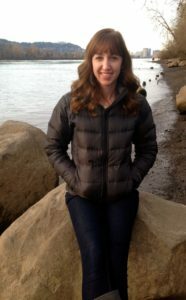 I find great ideas online, take a couple months to adapt those ideas and make them my own. Sometimes I use it as a way to procrastinate folding laundry, escape into a crafty world for an hour or two, or do a project that has a beginning and an end. I love letting my kids be a part of the planning (most of the time) as well. 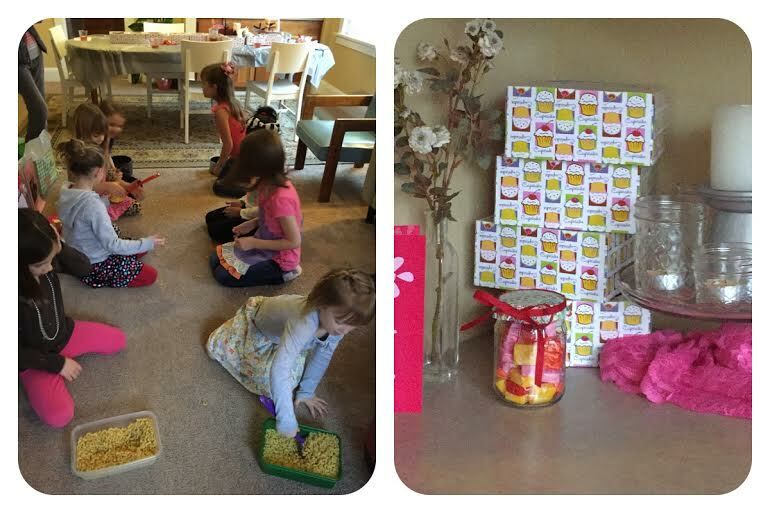 Jenna picked the theme for her birthday party months ago and it was such a fun party to throw. 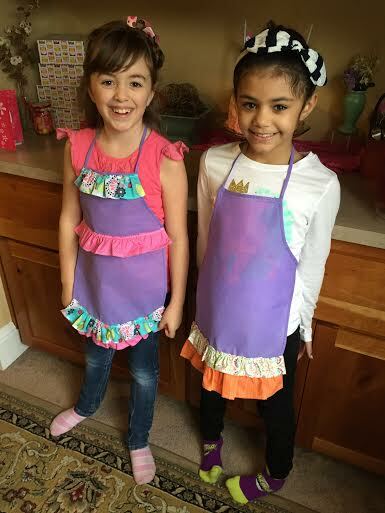 It did take a little prep leading up to the party but we had a great time in the kitchen together getting ready. If you ever want to throw a cooking/baking party, here are a few of the ways we did it if you want to steal some ideas. Jenna always wants a white cake with berry filling. I used the recipe here for the cake. I thought it was a bit too sweet and would use less sugar next time but everyone else really liked it. 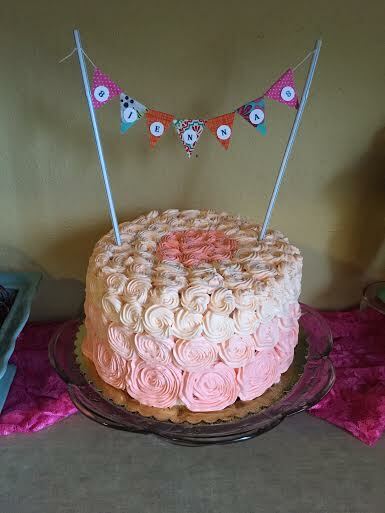 We did three, eight inch round cakes, three shades of pink for the frosting and decorated with simple rosettes (starting with big at the bottom and getting smaller toward the top). The pendant flags were made with fabric from the aprons, I glued on the letters and we used straws to hold it up. 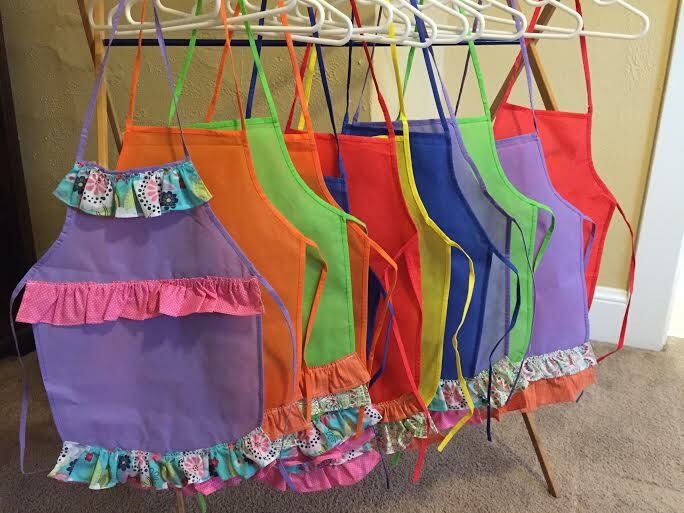 Jenna wanted aprons for all the girls to wear so I bought cheap aprons on Amazon and Jenna picked out cute fabric to sew ruffles onto them. We then took the supplies to my mom who made them (along with a little help from Jenna) look adorable. They added a fun flare to the party, kept their clothes mostly clean while making pies and decorating cupcakes and they could take them home. I bought small tin pie plates, a few pre-made pie crusts as well as a couple home-made pie crusts with special flour, and made filling for apple pies and mixed berry pies. 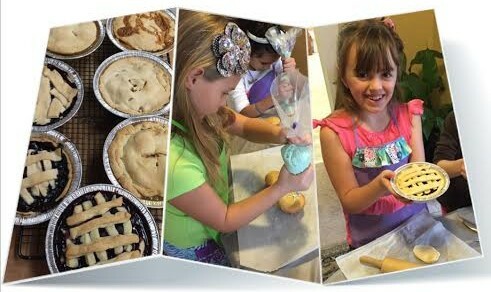 All the girls had to do was roll out the dough, cut it to fit the plate, fill it with the filling of their choice and make a top for it. I put them in the oven and by the time the party was done, the pies were too. I made the cupcakes ahead of time, filled a bunch of bags with different tips for decorating, pre-made some frosting, put sprinkles on the table and let the girls decorate their cupcakes. They did a fabulous job and then they got to take them home in adorable cupcake boxes I found at JoAnne’s (and I used multiple coupons to buy them of course). Those boxes may have been one my favorite parts of the party. It’s the small things people. Candy Jar Best Guess: I put starbursts in a jar and they guessed how many were in the jar. The best guess won the jar. Hot Potato: I found some fun kids music on Spotify, got a potato out of the fridge and voila, you have a fun game of hot potato. Pasta Race: I bought two bags of pasta and two spatulas at the dollar store. They split into two teams, sat in two lines so there was no running and had to take the pasta from one dish to the next passing the ladle down the line. The first to fill the pot with all the pasta won. I got fun drinking straws that changed color from the dollar store and sprinkles from the dollar section at Target for the other prizes. 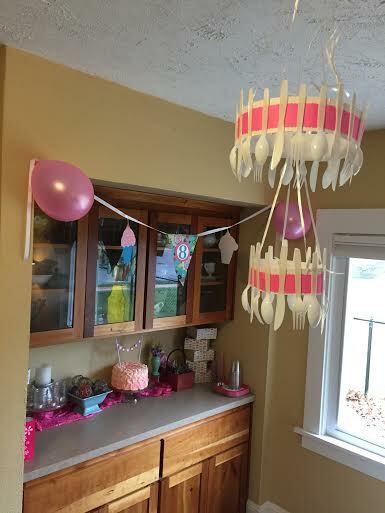 I printed out cupcakes to hang with the pendant I made out of left over fabric from the aprons, strung some hot pads and cooking utensils from ribbon, balloons and random things I had around the house to add to the ambiance. The most difficult decoration was the silverware chandelier. I just used card stock, plastic silverware, a glue gun and ribbon to hang it up. Things like that are totally unnecessary but fun to try. It was a fun afternoon for sure. Another memorable birthday celebrated. I can’t wait to see what Jenna dreams up for us to do next year. Birthdays are special around here, that’s no secret by now. 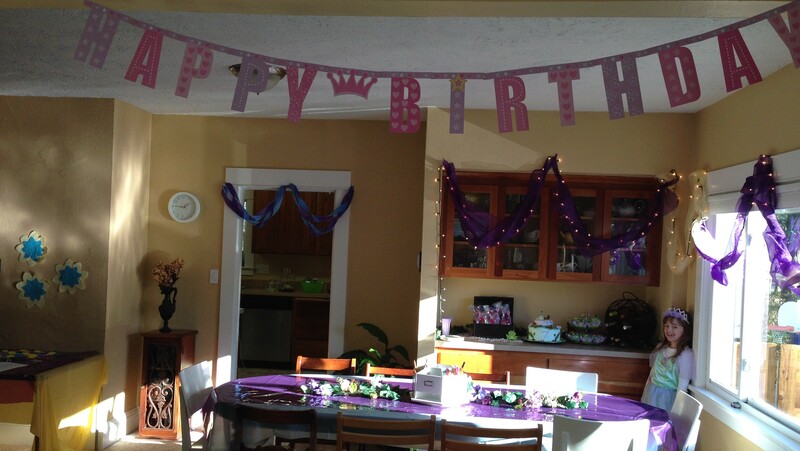 I go to great lengths to make sure my kids feel celebrated on their birthdays. 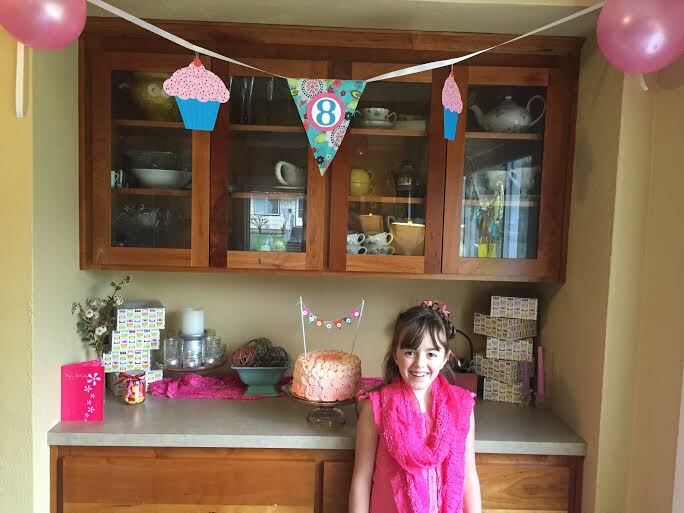 Jenna was especially excited about this party because it was her golden birthday. In her mind that was a very big deal. I remember how fun my golden birthday was as well. My husband on the other hand had no idea what we were talking about. Is this not common knowledge? Anyway, I digress. 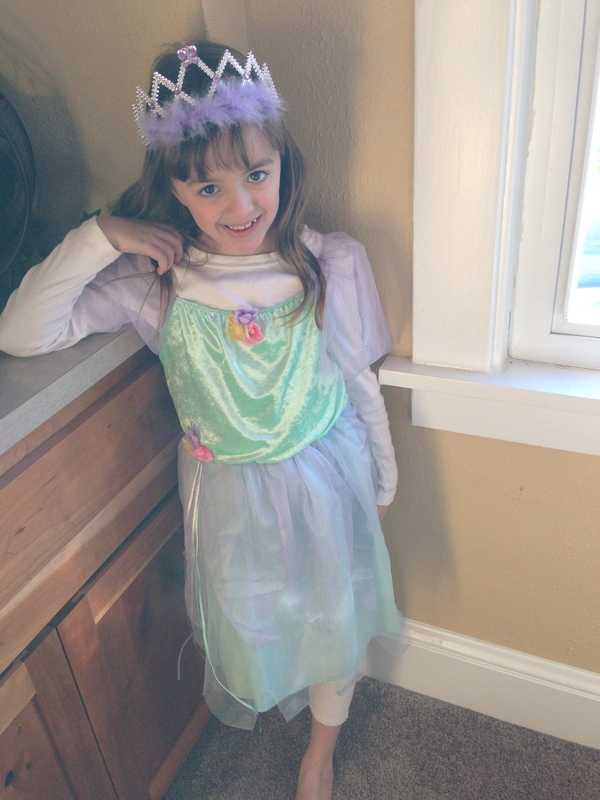 Since Jenna was two she’s been putting her two cents in on what she wants for her party. Each year she wants to be in on more and more of the planning and preparations. I hope she always keeps that drive about her and is sure of what she wants. It’s a great quality even if it means the cake is decorated more to her liking than mine (although I loved how it turned out). 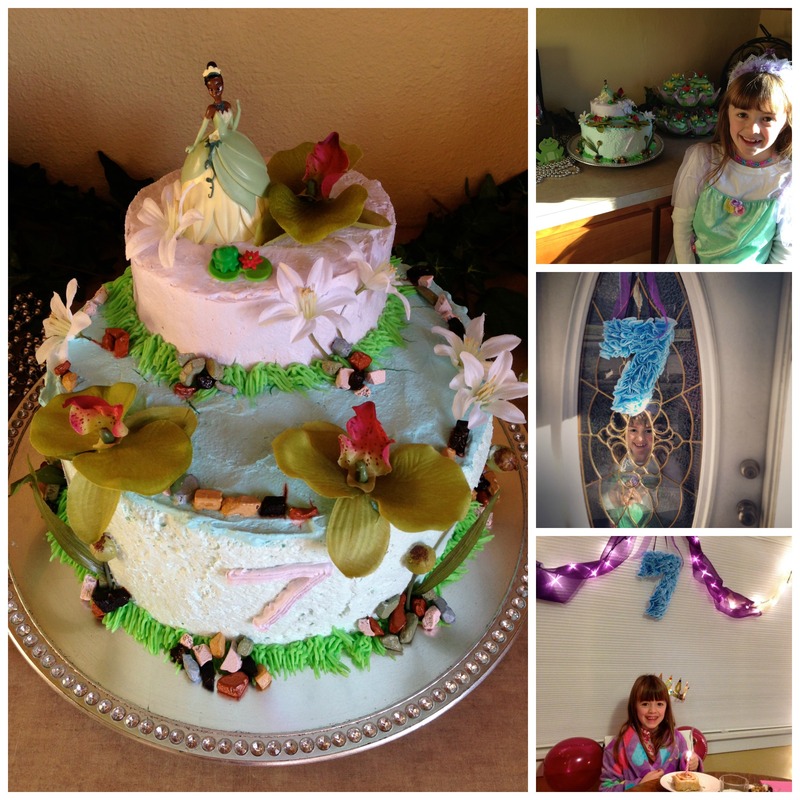 The party turned out terrific, the guests had a good time, and my princess felt celebrated. It was a very successful day. 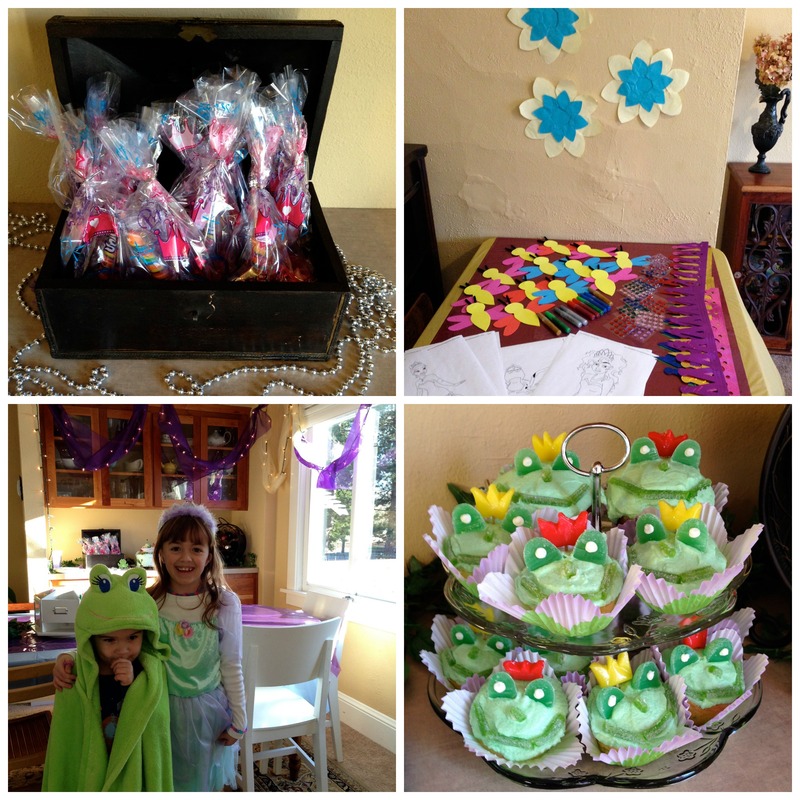 In case you can’t tell, the theme was The Princess and the Frog. The girls all dressed up in princess attire, we had frog cupcakes, A Princess Tiana cake, gift bags with rings, bracelets, a necklace, and a swirly sucker, and three crafts (coloring sheets, crowns to decorate with jewels, and lightning bugs to decorate with glitter glue and glow in the dark paint). Plenty of things to keep 8 girls busy for a couple hours. 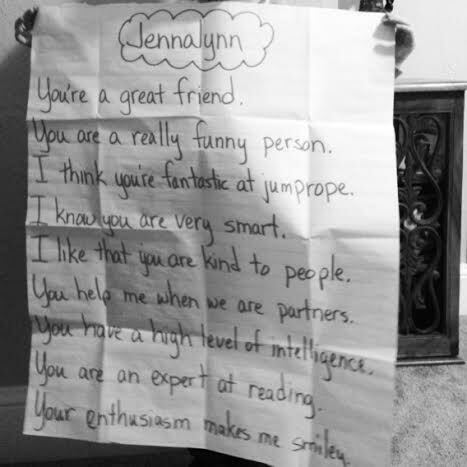 In Jenna’s class this year on each child’s birthday the students shares some of the things they admire and like about the birthday boy/girl. They write some of them out on a big sheet of paper and then each child also writes it out and they put it in a folder for the birthday boy or girl to take home. I love that even at school she felt cared for and celebrated. The list she came home with made me so proud and yes, laugh out loud a little. Kids say the cutest things. 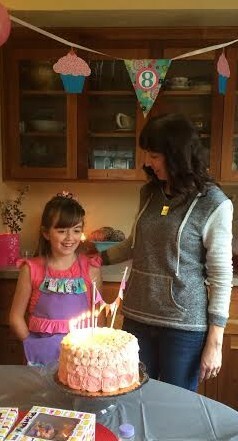 I’m so thankful for my sweet 7 year old, who’s enthusiasm, joy, kindness, and intelligence makes me smiley just like it does her classmates.